The morning of the first hunt, we eat a steady breakfast. I had tailored hunting clothes for the occasion. 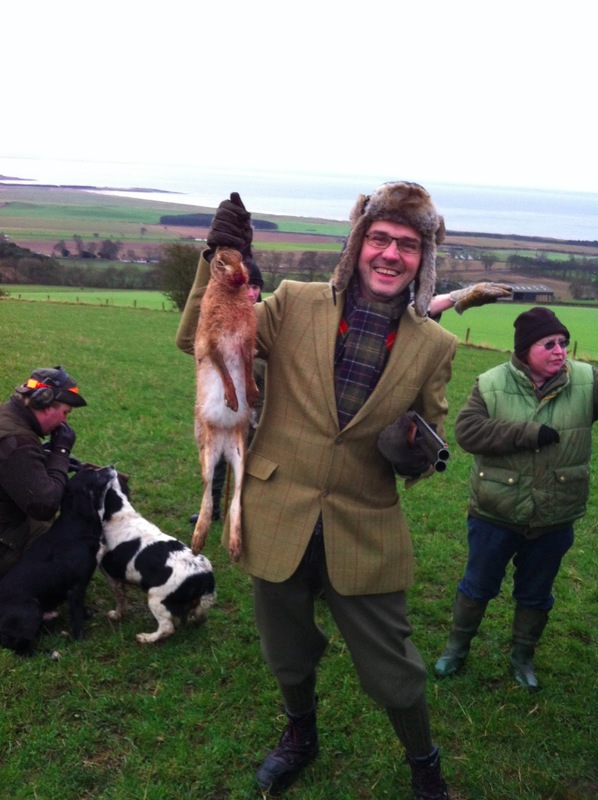 You do not go hunting in Scotland without regulations, dress code is serious for real. The first snow had come and melt away. The forest was like a muddy field, slippery and wet. Luckily, I was transported out of my the hunt with a quad. I had full job taking me the last few meters to my pass with weapons and crutch. One of the first hunts were fortunate. A rabbit chased by dogs against us. Obviously he stopped running after a while. The same applied pheasants that flew too close. They stopped flying. I've find it a little difficult to kill animals when I'm not hungry. I'd rather enjoy being out in nature and LOOK at the animals. Especially in the magical nature that Scotland offers. After each hunt regrouped ourselves a bit in the woods. It was re-assembly, and we drank gin to keep warm. I must say that the Scots are on the label all the way to the bitter end. 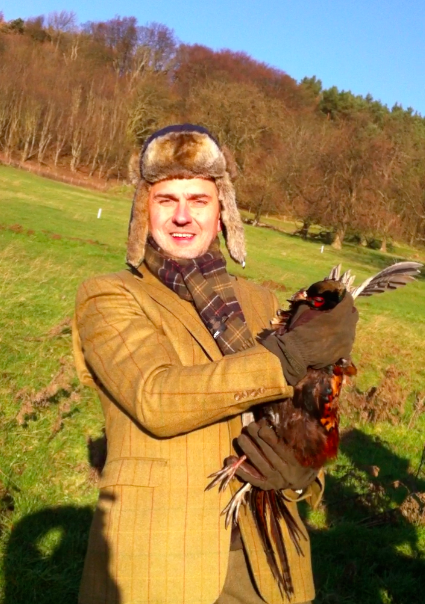 It does not matter if we were standing in mud up to their knees with a pheasant under his arm, or if you are at dinner. The label shall be held. I enjoyed it. Maybe I'm a little crazy. The day after the golf game at St. Andrews Old Golf Course. For obvious reasons I do not play golf. Not even with cortisone and Gin in the body. I can not. I would not even take me to the tee on the first hole. I was sitting in the locker room in the clubhouse. It was an experience. I can really feel the walls talk. Locker room is the most sacred in the clubhouse. Despite the recent discussions about discrimination, women have no access. There is after all a female locker rooms also in the clubhouse. There will be no women in the wrong locker room. Point. If there is an equally good service there as where I was, from natural causes never know. It was an incredible experience to meet Jöns and Kristina home in their castles. I was very well looked after. Although the castle is not accessible to me with Disabilities solved all the problems as they arose. I was pampered like an English Lord. Of course it was concluded dinner a black tie dinner. It feels solemn drinking afternoon gin tonic in tuxedos under the chandeliers. The atmosphere was by no means solemn, but relaxed and very pleasant. Many funny observations from hunting and golf round. I could write a whole chapter in my book about Jöns and his stories, but it is his stories, and he should write the book. Thanks Jöns, and thanks Kristina for your hospitality.